What does it mean to leverage technology? Before you can picture how IT strategy can be used in your business, look at some examples of how others have leveraged IT to solve problems and make improvements. This mini case study is an example of how overcoming a workflow constraint resulted in increased productivity and eliminated a daily frustration. A healthcare facility had a sophisticated medical records system that limited the printers that doctors could use while they were working with patients. The inability to use the printer closest to them added time and steps that affected the doctor’s physical workflow. This caused frustration and pressure on the doctors’ tight schedules. It decreased the number of patients they could see each day by two. The medical records software provider did not offer any satisfactory solutions. They proposed upwards of $200,000 in changes for additional infrastructure and equipment to accommodate the restriction in the medical records software. A web-based application was used to bypass the limited printer routes and redirect to any printer that was near to the doctor. The doctors gained efficiencies by decreasing the time and steps that they needed to retrieve a document from a printer. Their streamlined workflow allowed them to see more patients and spend a little more time with each patient. Daily stress and frustration was reduced because doctors felt like constraints to their workday were released. 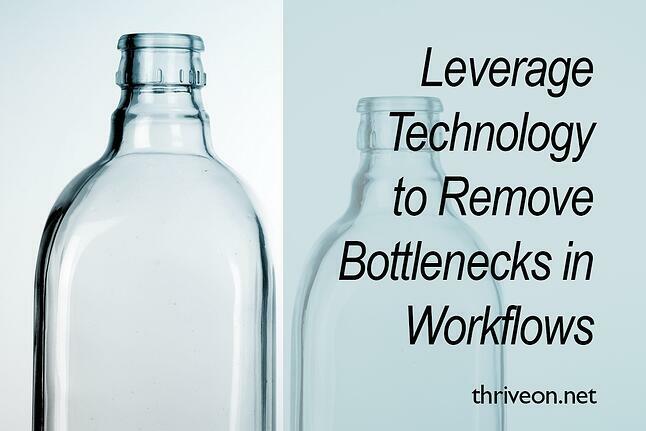 Look for opportunities to remove workflow constraints in situations where applications create extra steps, duplicate work, or bottlenecks. When others have said that what you want to do is not possible, there could be other ways to achieve your objective even if your vendor is unwilling or unable to help. If your business growth has stalled or your IT investments have not brought the ROI that you expected, there’s a disconnect between technology and business needs. At Thriveon, we help companies make sure that they are using the right technology to help their business improve and grow. We do that by providing them with an outsourced IT department and the creation of IT strategy that focuses on their objectives.